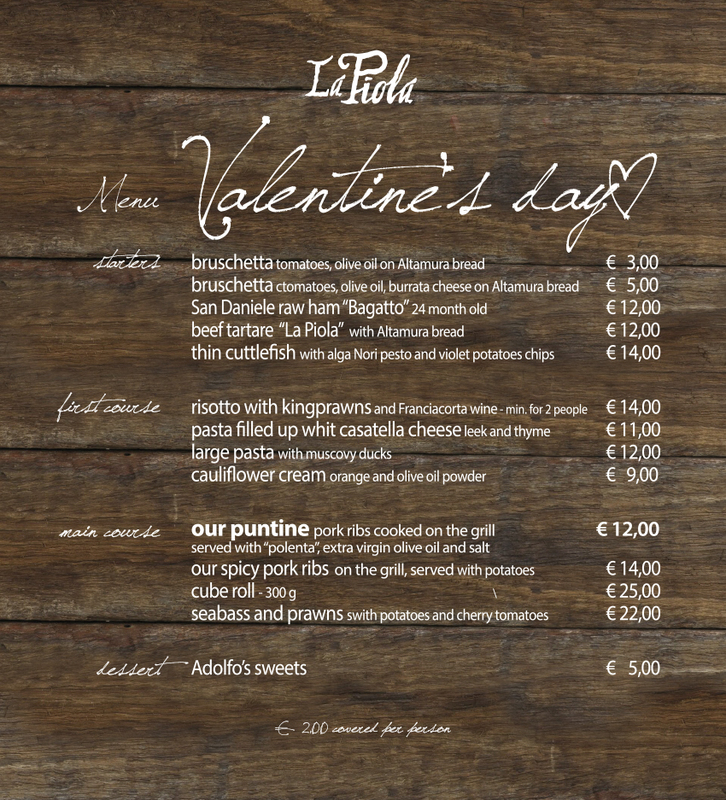 We are ready for Valentine’s Day! 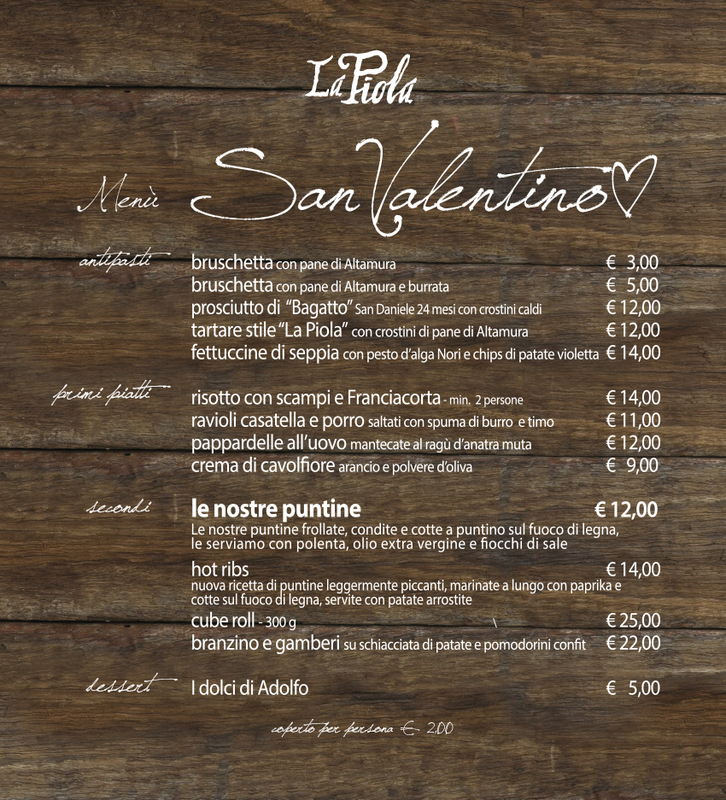 Siamo pronti per San Valentino! Christmas and New Year are coming. We offer gift packages of: wines, distillates, grappas, chocolate, biscuits, panettons and craft beers, salt and anchovies. You will find elegant “wooden boxes” in display at La Piola, in the new wine-making area for takeaway. Come back! Nicola and Nicolas and the legendary SPIEDO de LA PIOLA. Good company with the best meat of tradition and wood fire of a warm fireplace. – “delicate yogurt” cake with raspberry sauce. Soft drinks, wine, beer and coffee including. The new seasonal menu La Piola, from September, has the ribs with the traditional polenta with long cooking and selected cornmeal. We are ready for the last weekend before the holidays. We would like to greet you all before going on holiday… go to La Piola? We are closed from August 20th to September 3rd. See you on Tuesday, September 4th. Mr Lorenzo Bagatto, owner of the artisan production of San Daniele Ham, will present at “LA PIOLA” his fantastic product. The ham will be cut live with the berkel slicer for make you taste the craftsmanship, the love and the respect for our territory witch are since years the tradition of a great SAN DANIELE HAM. The menu will be of course the raw ham, daily fresh delivered Mozzarella from Campania, home made long pasta with San Daniele, our sweet, water and koffee. The dishes will be served with white wines of Simon Di Brazzan. In our shop I VINI LA ​​PIOLA you will find wine and gastronomic specialties that well represent the excellences of many regions of Italy. From the labels of the best known wines to real small bottled oenological jewels. Come and visit us! Our spring menu is fresh and creatively interprets the flavors of seasonal fruits; for Easter we have enriched it further by returning to its origin and tradition. We are waiting for you for lunch or even for an aperitif. Reservation is welcome. Easter Monday closed.